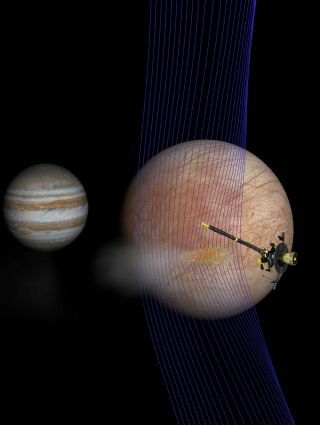 Artist's impression of NASA's Galileo probe swinging past Jupiter's moon Europa to sample a plume. If you're hoping for evidence of life on alien planets, this has been a very good year — and you didn't even have to look beyond our solar system. SUKRIT RANJAN — a post-doctoral researcher in the Earth, Atmospheric and Planetary Sciences department at the Massachusetts Institute of Technology (MIT) and an affiliated member of the MIT Kavli Institute for Astrophysics and Space Research. His research focuses on the origins of life from non-living chemistry. MORGAN CABLE— a technologist at the NASA Jet Propulsion Laboratory, California Institute of Technology, who works on instruments for spacecraft missions. She also served as the Assistant Project Science Systems Engineer for the Cassini Mission, which studied Saturn and its moons for 13 years until 2017. ANDREW STEELE — a staff scientist in the Geophysical Laboratory at the Carnegie Institution of Science. He is a co-author of a recent paper describing the complex organic material uncovered at Mars. Steele's expertise is in the detection of microbial life, which scientists agree is by far the likeliest sort that might emerge elsewhere in the universe. THE KAVLI FOUNDATION: There's been incredible news this year about the prospect of life in our solar system. Let's cut to the chase: Beyond Earth, which planet or moon does each of you believe has the best possibility of harboring life? MORGAN CABLE: Going from lowest to highest odds, my three choices are Saturn's moon Titan, then Jupiter's moon Europa, then back to Saturn and its moon Enceladus. Number two on my list is Europa. It also has an internal ocean. We now think it has plumes, through which we may have an exchange of molecules between the surface and interior, similar to what I just mentioned on Titan. Where Europa's ocean meets its shell of water ice, you could have life-supporting chemistry. But my number one is Enceladus. That's the only place in the solar system where we've confirmed there are active plumes — geysers shooting water into space that not only contain water, methane and hydrogen, but also complex organic molecules. Enceladus likely has all the ingredients for life. Plus, it's also one of the few places where we may be able to go and access a plume directly. By doing so, we may be able to answer the question about the existence of life elsewhere in the universe, once and for all. A self-portrait snapped by NASA's Curiosity rover during its Martian expedition. TKF: Let's talk a bit more about Mars. It's really having its moment. Andrew, you are part of a team that reported the seasonal variation of methane in the Martian atmosphere that Sukrit referred to earlier. Why is that seasonality important? STEELE: Those observations show Mars is "breathing." There is a cycle. The question is, why? Is Mars dead, in which case it is just breathing geochemically, or is it breathing because there is life? You can't conclude it's a sign of life until you've crossed off every other possibility. RANJAN: Normally, methane should break down chemically after a few hundred years, so you wouldn't expect it to return to the atmosphere when seasons change. The fact that methane is returning on time scales of several months implies something really weird is going on with the atmosphere, or maybe that life is playing a role. This discovery has raised a lot of major questions. RANJAN: Just a caveat here. We have to be careful what we mean when we say complex organics, because if you have a source of energy plus the elements carbon, hydrogen, oxygen, stuff like that, you expect some organic chemistry to happen. What's really interesting is the kind of organic molecules you get. There are certain kinds that non-living sources are really good at making, and you get them all the time. There are others that non-living sources are really bad at making, things like nucleotides, which are the building blocks for RNA and DNA. If you're finding nucleotides, then that's starting to sound much more appealing. STEELE: Sukrit's right — the formation of complex organics is not that surprising, and we're not seeing anything as complex as nucleotides on Mars. But where we are gaining ground is that complex organics are also an energy source. My previous research shows that Mars rocks are really very habitable. They're a basalt, similar to the rock we have from the volcanoes at Hawaii or Mount Etna in Italy. Creatures love basalts because they offer a lot of nutrients. At Mars, we're starting to set a baseline of the non-living chemistry. As a result, we can look for deviations from that baseline for hints about the presence of life, without having to make assumptions that life would work exactly as it does on Earth. We have to understand the chemistry of Mars as it is, not just how we usually see it on Earth. TKF: Let's jump farther out into our solar system to those moons. Morgan—you worked on theCassini mission, which wrapped up its 13-year exploration of Saturn and its moons last year. Cassini famously detected the plumes of material streaming off Saturn's icy moon Enceladus, with an exclamation mark coming just this summer when the plumes were announced to hold complex organic material. Why are these findings so important? Unfortunately, it's tough to make any definitive conclusions about them because the instrument that measured the grains is outdated — remember, Cassini launched in 1997. So, while we can't say that any of the Cassini instruments confirmed outright biomolecules, they did show a lot of rich chemistry. That points to things life could use, such as chemical building blocks and food. TKF: Morgan, you're also working on NASA's next mission to Europa, called the Europa Clipper. Just this past spring, new data suggested Jupiter's moon Europa also expels plumes of material into space, though there is some doubt about the findings. Assuming the discovery holds up, how do these plumes affect the Clipper mission and its goals? The plumes of the Saturn moon Enceladus, captured spewing from the moon's surface by NASA's Cassini spacecraft from a distance of 9,000 miles (14,000 kilometers) in 2010. RANJAN: That's a really good question. It's hard to say how far we've gone toward answering it because we have no other examples of life. It's as if we're walking down a road, and we're not sure when that road will end. But we do know where we want to end up. We want to get to some kind of self-replicating chemical system capable of Darwinian evolution. Scientists are exploring a number of different roads to get to that destination, though none has been fully successful yet. For example, I'm really interested in the "RNA world hypothesis" — the idea that the DNA and proteins integral to life started with another complex molecule, RNA, that's easier to arrive at chemically. So far in the lab, we haven't been able to build something even as relatively simple as RNA. There's still a lot of work that remains to be done. STEELE: Understanding our own solar system is sort of like having a Rosetta Stone with which to make sense of what we're seeing elsewhere. When we look at exoplanets, we're looking for light signatures in their atmospheres indicating the presence of gases that could only be produced by life. Because we're viewing exoplanets from very far away, we have limited data for drawing these sorts of inferences. Similarly, if aliens on an exoplanet were looking at our solar system, they'd likely be hard-pressed to find life on Earth. So it's critical that we make progress in learning what signs of life can look like. CABLE: The more discoveries we make, the more we realize that any assumptions we make could be wrong. I don't think any one of us would exclude the possibility that some other liquid, such as ammonia, methane, ethane or even a liquid form of carbon dioxide, could work as a potential solvent for life. But these liquids are going to behave differently than water. As a result, life in these liquids would have to be fundamentally different than life that could exist in liquid water. It doesn't mean that this alien lifewouldn't use the same, abundant, basic building blocks of carbon, hydrogen, nitrogen and oxygen. But it may put them together in different ways. RANJAN: Our best chances of detecting life as we don't know it are within our solar system. That's because we are limited in what we could conclude about exoplanets and exomoons without actually visiting them. Making a claim of life would be extraordinary on its own, so a claim of life using a solvent other than water would be difficult to prove convincingly. Follow all of the Expert Voices issues and debates — and become part of the discussion — on Facebook, Twitter and Google+. The views expressed are those of the author and do not necessarily reflect the views of the publisher. This version of the article was published Space.com.